Legumes are a specific group of vegetables that possess many health benefits. They are a great source of protein. Even though they are widely recognized by its high-quality plant protein, they are not enough in terms of the body’s needs for essential amino acids. For that reason, experts suggest combining legumes with whole grain. These two sorts of foods provide a body with the complete protein. Together, they are an excellent replacement for meat. Legumes also possess a rich content of antioxidant. According to nutritionists, red beans are far richer in antioxidants than blackberries. The high level of antioxidants makes legumes highly effective in suppressing and eliminating inflammation processes in the body. These powerful vegetables can decrease the risk of heart disease, reduce high blood pressure, and LDL or bad cholesterol. Legumes are full of complex carbohydrates and fiber. These two nutritional elements make us feel satiated for a long time. 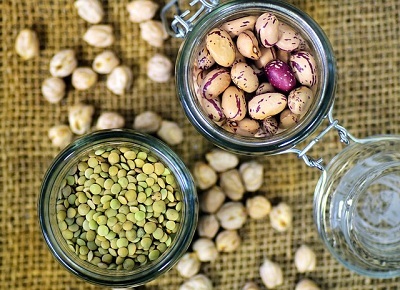 Studies have shown beneficial effects of legumes in the digestive system. Namely, fiber content, soluble as well as insoluble, regulates digestion and improves absorption of other nutritional elements. To learn more about the health benefits of legumes, the article “11 Important Health Benefits of Legumes – Reasons Why You Should Consume More Legumes Daily” gives us the following list. However, legumes contain so-called antinutrients that make absorption of iron, magnesium, zinc, and calcium extremely difficult. Amongst them, the most frequent is a phytic acid. Fortunately, it represents a threat to people who consume a lot of legumes together with whole grains and cereals. Vegans and vegetarians are more at risk than people who eat meat on a regular basis. There is one more ingredient, lectin, that also acts as antinutrient. It is more dangerous because of its ability to affect the lining in our digestive system in a bad way. But, when we cook and prepare legumes properly, we can completely exclude the risk. For that reason, experts recommend soaking dry legumes for 24 hours before cooking. Moreover, cooking process should last until beans are not fully processed. Sometimes, to take more of the health benefits of legumes, we need to cook them for more than three hours.